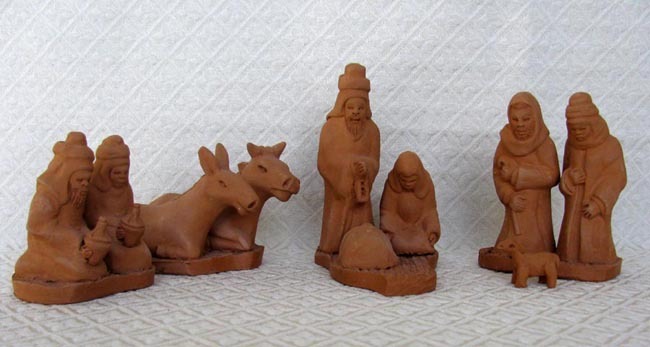 This Nativity was hand-sculpted from clay by Jean Ermann Désimots in Haiti. The set has an interesting feature where most of the figures are joined together in groups on clay bases. The set includes Joseph, Mary, baby Jesus, two standing shepherds, a donkey, an ox, a tiny lamb, and two kneeling wise men with gifts. The underside of each base is signed by the artist, Jean Désimots. Joseph stands 5.25 inches tall.